This post is a follow-up to the one I did recently about an 1891 Brodhead hunting expedition in Blooming Grove. The participants included some members of the Westbrook family, and I have since discovered traces of them in the book Commemorative Biographical Record of Northeastern Pennsylvania: Including the Counties of Susquehanna, Wayne, Pike and Monroe (Monroe Co., PA: J. H. Beers & Company, 1900), on pages 32-34; and 40-41. It turns out that John Coolbaugh Westbrook, Moses (‘Mose’) Westbrook, and Lafayette (‘Lafe’) Westbrook were brothers—children of Hannah Coolbaugh (1790-1874) and Solomon Westbrook (1794-1852). The book includes images of John and Lafayette, and while containing scant information on Moses, it goes into detail on the two other brothers. For those who are interested in reading about them, I am including the relevant excerpts from the book here. Some of the information in the below two bios overlaps, but I decided not to edit the overlapping bits out. There is much to wade through, but perhaps you will find clues relevant to your own research. I always especially enjoy reading what these biographers had to say about the character and appearance of their subjects. If you wade through these bios, you will be able to pick some interesting things out about both John and Lafayette. HON. LAFAYETTE WESTBROOK, of Stroudsburg, is one of Monroe county’s favorite citizens, having been chosen many times to offices of trust and responsibility. As a business man, a soldier and a citizen, he has shown those qualities of character which command respect and admiration, and the story of his successful career will be of lasting interest. Capt. Westbrook comes of good Colonial stock, members of the family having served with distinction in the Indian wars and in the Revolutionary war, but, unfortunately, the records of the early generations have not been preserved as fully as might be wished. The family is of Anglo-Saxon origin, but religious persecution in England caused their emigration to Holland at an early period. In 1630 the name appeared on the records at Albany, N. Y., among the settlers on the manor of Patroon Van Rensselaer. On October 9, 1665, John Westbrook was at Portsmouth, N. H., and in 1689-90 the names of Job and John appeared on the records. In 1721, Col. Thomas Westbrook, said to have come from Stroudwater, Gloucestershire, England, was a shipbuilder and large landowner in the State of Maine, and the town of Westbrook, Maine, was named in his honor. In that year he commanded the expedition against Norridgewock, which broke up the settlement of the famous Jesuit priest, Father Ralle, and captured his papers. In 1723 he was appointed by Gov. Dunmore as the chief in command of the Eastern frontier. I. Anthony Westbrook, the first ancestor concerning whom we have any definite information, removed from Guilford, Ulster Co., N. Y., about 1737, and located in Montague township, Sussex Co., N. J., where he became the owner of a large tract of land along the Delaware river and on Minisink Island. He was prominent among the settlers there, holding the office of justice of the peace, and left a record of the earliest marriages contracted in the Minisink Valley. He married Antic Van Etten, and among their children were two sons, Jacob and Johannes. II. 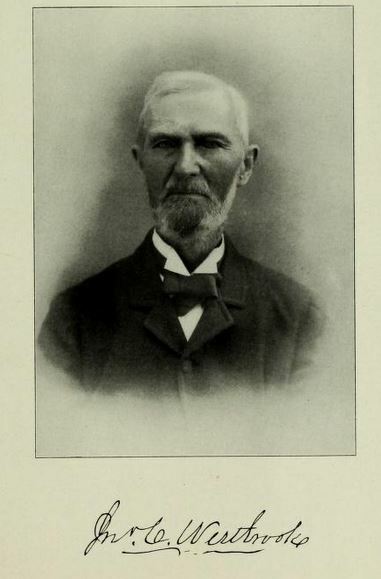 Jacob Westbrook, a son of Anthony, was married. March 24, 1746 to Lydia Westfall, and had six children. Blandina, Johannes, Sofferine, Solomon, Maria and Jane. III. Solomon Westbrook, the next in the line of descent in which we are now interested, was born in 1762 and died in 1824. He located in Delaware township. Pike Co., Penn., and there owned 700 acres of land upon which he built a stone house that was occupied by the family and for nearly a century, and in times of danger was used as a fort. In 1801 he was assessed with 150 acres of improved land, and at that time he was justice of the peace: Like many of the large agriculturists of his day, he owned slaves, and he was regarded as a wealthy and substantial citizen. He married Margaret DeWitt, and they had the following children: Jacob (1786-1847), who settled upon a portion of the old homestead, and was the father of John I. Westbrook, of Port Jenvis, NY; Col. John, born in 1789, who settled at the homestead, and was a member of Congress from 1841 to 1843; Solomon, our subject’s father; Sofferine; and Margaret, wife of William H. Nyce. IV . Solomon Westbrook was born in 1794, and died in. 1852. He was a man of hue business ability, and was well known throughout the Delaware valley! In 1819 he sold his farm to his brother Jacob, and purchased another in Middle Smithfield township, Pike county, where he resided until 1829. He then sold his place to John V. Coolbaugh, removed to Philadelphia for a year, and for five years following he conducted a hotel at Dingman’s Ferry owned by Judge Dingman. While there (in 1832) he opened a store, and he also carried on mercantile business at Bushkill in 1830-31, and at Tafton in 1835-36. For some time he was interested in lumbering at Blooming Grove. In 1835 he removed to the old stone house on the homestead, and in 1837 a paralytic stroke nearly incapacitated him for business, depriving him of the power of -speech. In 1842 he’ returned to Blooming Grove, where he and his wife spent their remaining years, his sons taking care of his lumber business. He took much interest in local politics during his active years, and from 1822 to 1825 he served as sheriff of Pike county. He married Hannah Coolbaugh (1790-1874), a daughter of Judge John Coolbaugh, of Middle Smithfield township, Pike county, and they had six children : Margaret (deceased, who married the late John B. Stoll, of Branchville, later a resident of Newark, NJ. ; John C, of Pike county; who is mentioned elsewhere; Hiram, late a real-estate dealer of Ridgewood, NJ. ; Lafayette, our subject; Moses C, a farmer at the old home in Blooming Grove; and Susan, who married the late Theodore Grandon of Newark, New Jersey. V. Capt. Lafayette Westbrook was born December 15, 1824, near Dingman’s Ferry, in Pike county, and received an excellent education for that day at Delaware Academy. He became proficient as a surveyor, and in 1850 and 1853 was elected surveyor of Pike county, serving two terms with marked success. I Ie is considered an authority on the location of land in that region, and at one time he assisted in making a map of Dike count)-; throughout his life he has been more or less occupied with surveying. In 1850, our subject was chosen to represent Pike and Monroe counties in the State Legislature, and so well did he perform his duties that he was re-elected the following year. In 1862 he assisted in raising Company B, 151st P. V. I., and entered the service with the rank of first lieutenant. In March 17, 1863, he was made captain, and this rank he held until honorably discharged, on July 27, 1863, at the expiration of his term. While in the service he was never absent from his command for one moment, and he took part in several important engagements, including the battles of Chancellorsville and Gettysburg. On his return home he resumed work as a surveyor, and he also engaged extensively in lumbering in Blooming Grove, where he resided until 1882; in 1874 he was elected county surveyor against his own wishes. In 1866, he was again chosen representative in the State Legislature, his district being changed to Pike and Wayne counties. His ability and experience made his services of so great value to his fellow citizens that, in 1867, he was re-elected without opposition. In 1877 and 1878, under the new constitution, he again represented Pike county in the Legislature – each county being entitled to a member – thus completing six years of service in this capacity. The Captain has been regarded for many years as one of the leading Democrats of this section, and at various conventions, State and National, he has taken an honorable part in the work of the party. At times he has held local offices, including that of justice of the peace, and his interest in educational advancement has been shown by his services as school director. 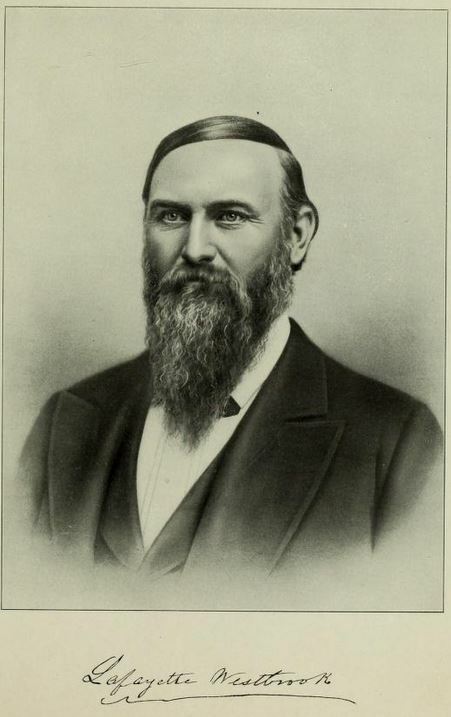 During all these years he has conducted his lumber business in connection with surveying, but in 1882 he removed to Stroudsburg, relinquishing a portion of ‘ his business cares; his investments, however, receive his personal attention, and for some time he has acted as a director and as vice-president of the East Stroudsburg National Bank. The Captain looks much younger than he is, and his active and cultured mind makes him a most agreeable companion. Socially he is much esteemed, and he is identified with the Masonic Fraternity being a Master Mason in the Lodge at Milford, Pike county. During the war he received a certificate from the Grand Lodge: which he still holds In October 1876, Captain Westbrook married Miss Emma Hill, of Newton, NJ; their only child died at an early age. JOHN COOLBAUGH WESTBROOK. Few citizens of this section enjoy to as high a degree the confidence of the public as does this well-known resident of Milford, whose popularity is attested by his frequent election to offices of responsibility and trust. For many years he has served ably and acceptably as prothonotary and county auditor, and as recorder of deeds, register of wills, clerk of the Orphans’ Court, Clerk of Court of Assertions, he has also shown characteristic ability, zeal and fidelity. Mr. Westbrook comes of good old pioneer stock, and traces his descent to an English family, some of whose members went to Holland at an early period to escape religious persecution. The records at Albany, N. Y., show that in 1630 some of that name were settlers on the manor lands of Patroon Van Rensselaer, having come with a Dutch colony. On October 9, 1665, John Westbrook was at Portsmouth, N. H., and in 1689-90 Job and John Westbrook were there. In 1721 Col. Thomas Westbrook, a wealthy land owner and ship builder of Maine, said to have come from Stroudwater, Gloucestershire, England, commanded the expedition against Norridgewock, which broke up the settlement of the famous Jesuit priest Father Ralle, and captured his papers. Two years later he was appointed by Gov. Dunmore as chief in command of the eastern frontier of the Colony of Maine, and he seems to have wielded an important influence in that commonwealth, the town of Westbrook having been named after him. In every generation the love of liberty has been a leading characteristic of the family, and its members have not hesitated to make open resistance to tyranny, several having served in the Revolutionary army. The definite records of our subject’s ancestry began with Anthony Westbrook, who came to Pennsylvania from Guilford, Ulster Co., N. Y., and settled in the Minisink Valley, where he acquired a large tract of land. In 1737 he was a justice of the peace and an elder in the Reformed Dutch Church, while his brother Johannes, who preceded him, was also prominent in the settlement. Anthony Westbrook married Antie Van Etten, and had at least two children, Jacob and Johannes. Jacob Westbrook became the owner of a large tract of land on the east bank of the Delaware river, about eight miles below Port Jervis, in what is now Montague township, Sussex Co., N. J. His substantial stone house was often used as’ a fort during the troubles with the Indians, as was that of his son Johannes, three miles farther down the Delaware river. Like other pioneer families the Westbrooks kept slaves in the early days. Jacob Westbrook was married March 24, 1746, to Lydia Westfall, and had six children: Blandina, Johannes, Sofferine, Solomon, Maria and Jane. Solomon Westbrook, our subject’s grandfather, was born October 6, 1762, and died March 30, 1824. In 1792 he located upon a tract of 700 acres of land on the west bank of the Delaware river in Delaware township, Pike county, and his residence, a large stone house, stood on the stage road, two miles below Dingman’s Ferry. In 1801 he was assessed with 150 acres of improved land, and was serving as justice of the peace. On September 24, 1782, he married Margaret De Witt, by whom he had five children: Jacob (1786-1847), who resided on a part of the homestead, and was the father of John I. Westbrook, of Port Jervis; Col. John (1789- 1852), a leading spirit in the State militia, a member of Congress (1841-1843), and one of the ablest men this section ever produced; Solomon, our subject’s father; Sofferine; and Margaret (Mrs. William H. Nyce). Solomon Westbrook (2), the father of our subject, was born in 1794, and died in 1852. he was a successful business man, and was also active in politics, serving one term as sheriff of Pike county ( 1822-1825). In 1819 he sold his farm to his brother Jacob, and purchased another in Middle Smithfield township, where he remained about ten years; but in 1829 he disposed of the place to John V. Coolbaugh, and removed to Philadelphia. In 1830 be returned and opened a store at Bushkill, which he carried on for a year, while for five years he conducted a hotel at Dingman’s Ferry. In 1832 he opened a store there, and he also carried on mercantile business at Tafton in [835-36. In the meantime he became extensively engaged in lumbering at Blooming Grove, but a paralytic stroke in 1837 deprived him of the power of speech while he was yet in the prime of manhood, lie had removed with his family in 1835 to the old stone house in Delaware township; then in 1842 the family located at Blooming Grove, where his sons carried on the lumber business for many years. His wife was Hannah Coolbaugh, of Middle Smithfield township. Pike comity. Of their children, Margaret, the eldest (deceased) was the wife of John B. Stoll, of Branchville; John C, our subject, is mentioned more fully below; Hiram (deceased) was a real-estate dealer at Ridgewood, NJ, and was twice married, (first) to Eunice A. Horton, and (second) to Jennie M. Maston ; Lafayette, a resident of Stroudsburg, is mentioned elsewhere; Moses C., a farmer on the homestead at Blooming Grove, married Emily Jones; Susan a resident of Milford, married (first) Theodore Grandon, and ( second) William H. Bell, both of whom are now deceased. Our subject was born May 24. 1820, in Middle Smithfield township, Pike county, then a portion of Delaware township. He began his education in the country schools, afterward studying for some time with Rev. Mr. Allen at Milford. At the age of fifteen he became a clerk in his father’s store at Dingman’s Ferry, and after the latter’s health failed he took charge of the business, assisted by Col. H. S. Mott. Together with his brothers he also managed the lumber business at Blooming Grove, and later he cleared a farm there upon which he built a sawmill and a gristmill. In 1845 he was elected prothonotary of Pike county, on the Democratic ticket, and removed to Milford. After serving two terms he returned to Blooming Grove, and in the fall of 1863 he was again chosen to that office, which he held for six years. In 1870 he removed to Branchville, NJ., and during the following year he secured from various individuals the land for Blooming Grove Park. In 1872 he went to Berks county, Penn., and for three years acted as foreman in the construction of the Boston & South Mountain R. R., running from Harrisburg to Poughkeepsie. In the fall of L875 he returned to Milford, and was elected prothonotary, to which office he has since been continuously re-elected, having held the office in all thirty-five years. Socially Mr. Westbrook and his family are prominent, and he is connected with various orders; he is a Master Mason, having joined the fraternity at Hawley. On December 31, 1850, Mr. Westbrook was married at Milford to Miss Jane Wells, and four children have blessed the union: Alice B., who resides in Milford, married (first) Dr. Governor Emerson, and after his decease wedded the late Milton B. Mott, formerly editor of the Milford Dispatch, and a representative in the State Legislature. Hannah married John Williamson, of Branchville, N. J., now deceased. Frank Brodhead and Lafayette died unmarried. Mrs. Westbrook was born at Milford, January 24, 1824, only child of Peter and Jane Wells, and, both parent’s dying when she was an infant, she was reared by her grandmother, Jane Wells.